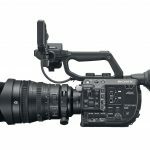 In a surprise announcement on Friday, Sony released the handheld, PXW-FS5. The key features of this new camera its size, (weighing in at only 1lb. 13.2 oz. ), 4k capabilities and high frame rates. The cost for the camera will be $6699 for the body only and $7299 with a lens. Right now, B&H has the ‘body only’ model listed at $5599 for pre order. The camera is equipped with an 11.6 million pixel Super35 Exmor™ CMOS Sensor, enabling 4K XAVC long GoP high-definition video shooting. It is the world’s first Super35 camcorder with a built-in electronic variable ND filter, supporting linear control from 1/4ND to 1/128ND and further expanding the depth of field representation. 1/10 times Super Slow Motion reproduction is possible through 10-bit 4:2:2 full HD 240fps High Frame Rate, with no sensor cropping. Sony describes this camera as being for DSLR users looking to “step up”. However, at this price tag, you’d be better off looking elsewhere. The bit rate on this camera just doesn’t compare to what’s already on the market under this price, i.e. the Ursa Mini. 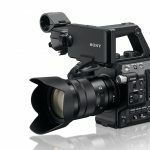 PARK RIDGE, N.J., Sept. 11, 2015 /PRNewswire/ — Sony is expanding its line of large sensor 4K technologies with the PXW-FS5 compact Super 35mm camcorder. 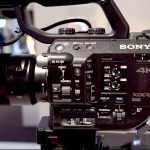 The new model rounds out Sony’s line of 4K professional cameras, filling an important niche between cameras like Sony’s PXW-FS7 and the NEX-FS700, or complementing Sony’s new consumer a7R II and a7S II models. The compact power zoom E lens PZ 18-105mm F4 G OSS (SELP18105G), provided in the PXW-FS5K kit model enables zoom operation with one hand. Integrating easily with other camera lenses, Sony’s a Mount System offers compatibility with both Sony and third-party lenses. The PXW-FS5’s E-mount can take virtually any lens, such as SLR lenses via an adapter, as well as Sony’s E-mount and A-mount lenses, ensuring the camera adapts to multiple environments. 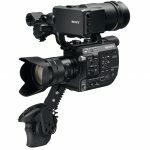 Sony’s a Mount System and its enhanced interfaces include 3G-SDI, HDMI output and dual SD card slots. Also equipped with Wi-Fi and a wired LAN terminal, the PXW-FS5 features enhanced network functions such as file transfer and streaming transmission. A planned future firmware update will provide RAW output. The lightweight (1 lb., 13.2 oz.) body with excellent weight balance ensures comfortable handheld shooting as well as an easy fit with a drone or gimbal. The one-touch rotatable grip enables instant switching between low or high angle shooting. Shooting parameters can be changed with one hand even during recording by using the multi-functional grip. The zoom can be operated similarly with a single hand. 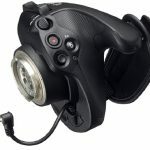 The detachable handle, one-touch rotatable grip and flexible LCD panel support various shooting styles. The camera is equipped with an 11.6 million pixel Super35 Exmor™ CMOS Sensor, enabling 4K XAVC long GoP high-definition video shooting. It is the world’s first Super35 camcorder with a built-in electronic variable ND filter, supporting linear control from 1/4ND to 1/128ND and further expanding the depth of field representation. 1/10 times Super Slow Motion reproduction is possible through 10-bit 4:2:2 full HD 240fps High Frame Rate, with no sensor cropping. Low light capabilities and background defocus are heightened by the high sensitivity and large sensor size. 14 stops of latitude in exposure deliver strong grayscale rendition without crushing shadows or blowing out light details. The camera’s interfaces include 3G-SDI, 4K HDMI output, MI shoe, dual SD card slots, Wi-Fi and wired LAN terminal, supporting various system configurations. The Clear Image Zoom feature allows users to zoom in at up to 2x, even with a fixed focal length lens. 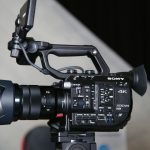 Find out more about the PXW-FS5 at www.sony.com/fs5.